The Woodford Folk Festival is a 6-day community festival which boasts over 2000 performers and over 400 events. The festival is filled with music, theatre, film and comedy with heaps of programs for all ages to enjoy. The Woodford Folk Festival started back in 1986 and has grown today into one of the largest festival events on the Sunshine Coast. The festival is housed in over 35 venues and there is a huge program scheduled again for 2019/2020. Each year, you will find a program filled with live musical performances, poetry, film, writing workshops, stand-up comedy, environmental discussions and kids programs. There will be plenty of opportunity for arts and crafts as well as a community parade. Season tickets can be purchased which will cover you for the full 6 days of the festival. If you are only purchasing a one day ticket, you will need to ensure you specify the date which you will attend. There are no 2 or 3-day tickets available. Camping is available during the festival. If you intend to camp overnight in a car, caravan, tent or motorhome, you will need to purchase a camping ticket. Camping sites are booked on a first come, first served basis. 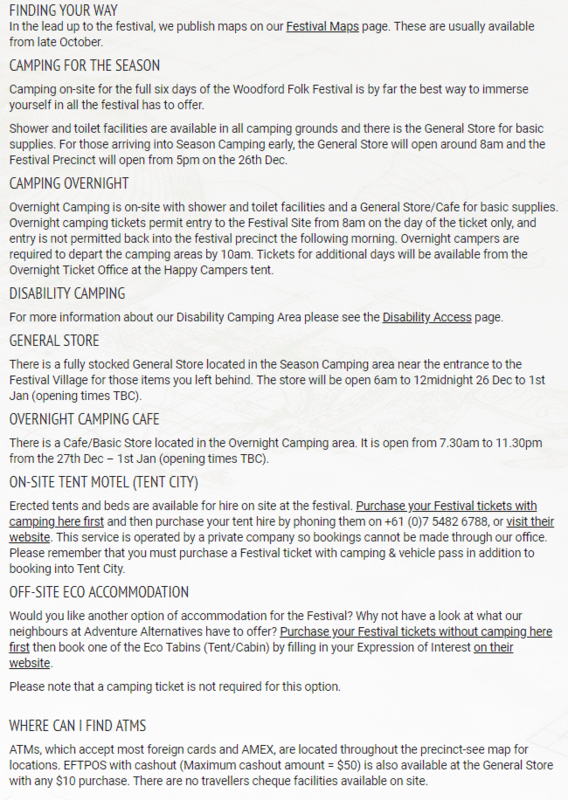 There is a general store located inside the festival grounds and Shower and toilet facilities are available in all camping grounds. 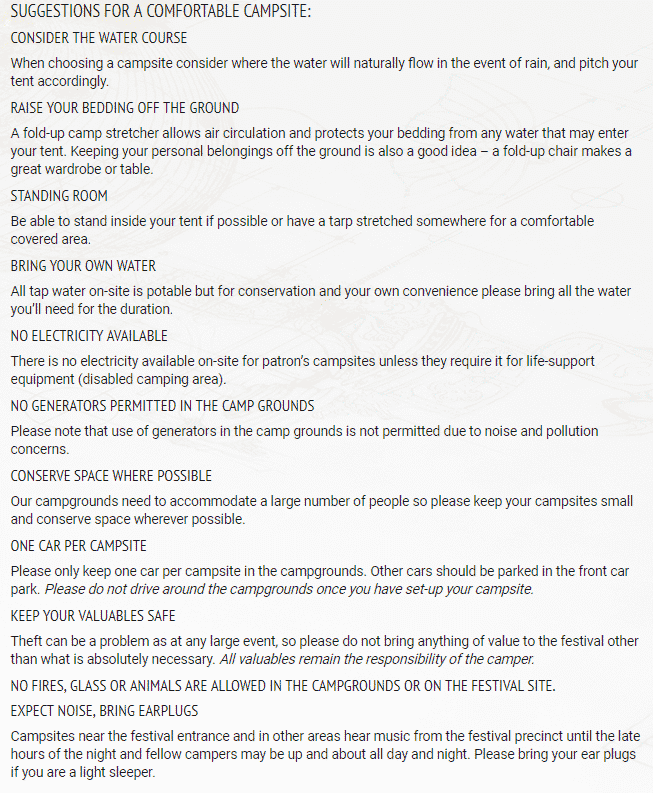 Tap water is available, but campers are requested to bring sufficient drinking water for their stay. The use of generators is not permitted inside the camping grounds nor are pets or glass items permitted. Purchase a parking permit in order to park onsite. There is EFTPOS available at the festival shop, an internet café which is located in the cyber garden and there are also lockers for patrons use. Please see all of the images below for frequently asked questions, performers and more. If we intend on staying only 3 days at the Woodford Folk Festival how much would camping cost on top of our festival day/night tickets. Not sure if you can purchase a day ticket with camping. Season tickets can be purchased which will cover you for the full 6 days of the festival, with or without camping. There are no 2 or 3 day tickets available. If you are only purchasing a one day ticket, not sure if there will be an option to add camping to a day ticket. Check back later in the year when tickets go on sale as I will update our page with further information. 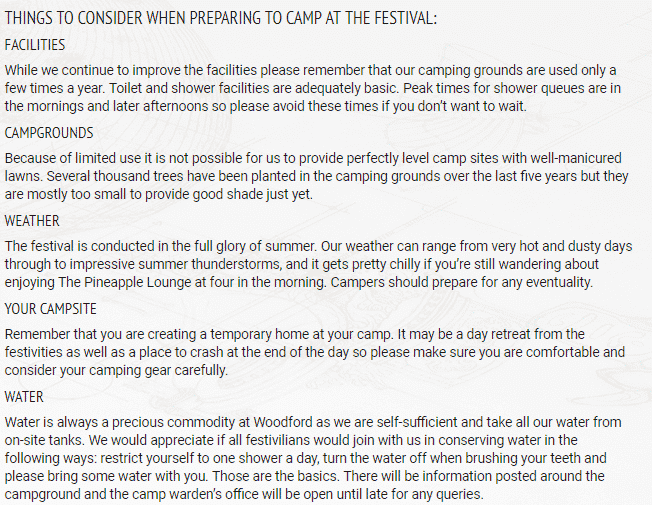 When do the early bird tickets for woodford go on sale please? The organisers noted on 31 May 2018 that tickets would go on sale ‘soon’ so I would keep checking throughout June, as they are likely to be released in the next month. Early Bird tickets to the Woodford Folk Festival will be on sale Monday 15th of May 2017.